Friction depends partly on the smoothness of the contacting surfaces, a greater force being needed to move two surfaces past one another if they are rough than if they are smooth. However, friction decreases with smoothness only to a degree; friction actually increases between two extremely smooth surfaces because of increased attractive electrostatic forces between their atoms. Friction does not depend on the amount of surface area in contact between the moving bodies or (within certain limits) on the relative speed of the bodies. It does, however, depend on the magnitude of the forces holding the bodies together. When a body is moving over a horizontal surface, it presses down against the surface with a force equal to its weight, i.e., to the pull of gravity upon it; an increase in the weight of the body causes an increase in the amount of resistance offered to the relative motion of the surfaces in contact. The coefficient of friction is the quotient obtained by dividing the value of the force necessary to move one body over another at a constant speed by the weight of the body. For example, if a force of 20 newtons is needed to move a body weighing 100 newtons over another horizontal body at a constant speed, the coefficient of friction between these two materials is 20/100 or 0.2. Different materials in contact yield different results; e.g., different resistances are felt if one pushes a block of wood over surfaces of wood, steel, and plastic. A different coefficient of friction must be calculated for each different pair of materials. There is more than one coefficient of friction for a given pair of materials. More force is needed to start a body moving across a surface than is needed to keep it in motion once started. Thus the coefficient of static friction (describing the former case) for a pair of substances is greater than the coefficient of kinetic friction (describing the latter case) for the substances. Similarly, sliding friction is greater than rolling friction. The force of friction between two materials can be calculated by multiplying the coefficient of friction between these materials (determined experimentally and listed in engineering handbooks) by the force holding them together (e.g., the weight of the moving body). Fluid friction is observed in the flow of liquids and gases. Its causes are similar to those responsible for friction between solid surfaces, for it also depends on the chemical nature of the fluid and the nature of the surface over which the fluid is flowing. The tendency of the liquid to resist flow, i.e., its degree of viscosity, is another important factor. Fluid friction is affected by increased velocities, and the modern streamline design of airplanes and automobiles is the result of engineers' efforts to minimize fluid friction while retaining speed and protecting structure. the mechanical resistance that arises in the plane of contact between two bodies during their relative movement. The force of resistance F, which is directed opposite to the relative movement of the given body, is called the frictional force acting on the body. Friction is a dissipative process that is accompanied by the evolution of heat, the electrification and destruction of the bodies, and other effects. A distinction is made between sliding and rolling friction. The first type is described by the coefficient of sliding friction fs, which is the dimensionless ratio of the frictional force to the normal load; the second is described by the coefficient of rolling friction fr, which is the ratio of the rolling frictional moment to the normal load. External conditions, such as load, velocity, roughness, temperature, and lubrication, have no less an effect on the magnitude of friction than does the nature of the rubbing bodies; external conditions may cause a severalfold change in friction. Sliding friction. If the component of the force applied to a body that lies in the plane of contact between two bodies is insufficient to cause one body to slide with respect to the other, the frictional force developed is called the static friction (OA in Figure 1). It is caused by small (about 1 micrometer [μ]), partially reversible displacements in the contact area, which are proportional to the applied force and vary as the force increases from zero to some maximum value (point A in Figure 1), called the limiting friction, or stiction. The movements are called preliminary displacements. After the applied force exceeds the critical value, the preliminary displacement changes to a sliding displacement, and the frictional force is somewhat reduced (point At) and ceases to be a function of the displacement (kinetic friction). Because of the irregularity and roughness of each surface, contact occurs between two solid bodies only at individual junctions, which are concentrated at the tops of protuberances. The size of the junctions depends on the nature of the bodies and the friction conditions. The more rigid protuberances penetrate the deformable counterpart, thereby forming individual points of actual contact, where attachment forces arise (adhesion, chemical bonding, interdiffusion, and so on). As a result of wearing-in, the points of contact become “elongated” in the direction of motion. The diameter of a point of contact of equivalent area ranges from 1 to 50 (α-, depending on the nature of the surface, the type of treatment, and the friction conditions. During sliding, the points of contact are inclined at a certain angle to the direction of motion, and the material is pushed aside and is crushed down by the sliding irregularity, but the adhesion spots that form from the surface films that cover a solid body, called junctions, are continuously sheared off and re-formed. The stresses achieved in these spots are only a few times less than the theoretical strength of the material. The resistance of the material to displacement in shear is a function of the dimensionless characteristic h/R, which is the ratio of the depth h of penetration of a unit irregularity (simulated by a spherical segment) to the radius of penetration R. This ratio determines the mechanical component of the frictional force. Most of the deformation described above is elastic, and the energy dissipation is due to hysteresis losses. Forces of molecular interaction arise in the points of contact, and the losses in overcoming these forces are evaluated by the dimensionless characteristic τ/σs, where τ is the shear strength of a molecular bond and σs is the yield point of the base. The molecular shear strength is τ = τ0 + βPr where τ0 is the strength of a junction in the absence of compressive load, Pr is the actual pressure on the point of contact, and β is the modulus of strain hardening of the junction. Every point of contact, called a frictional coupling, exists for only a limited time, since a protuberance is disengaged. The lifetime of a frictional coupling is an important characteristic, since it determines the wear resistance, the temperature developed by the friction, and other factors. Thus, friction is a dual process: on the one hand, it involves the dissipation of energy in overcoming molecular bonds, and on the other, it causes the formation of a surface layer of material with imbedded irregularities. where K is a coefficient associated with the height distribution of the protuberances and αh is the coefficient of the hysteresis losses. From the equation it follows that friction as a function of pressure for constant roughness or as a function of roughness for constant pressure passes through a minimum. During the wearing-in of a friction pair, a roughness corresponding to a minimum coefficient of friction is established. For the efficient operation of a friction pair it is essential that the surface layer of a solid body have a lower shear strength than the deeper layers. This is achieved through the use of various liquid lubricants. In this case the friction bodies are separated by a layer of liquid or gas in which the bulk properties are manifested and the laws of fluid friction hold where there is no static friction. Sometimes it is necessary to have a weakened surface layer on the body itself; this is achieved by using surfactants (additives to the lubricants) and coatings of soft metals or polymers, or by creating protective films having a low shear strength. Friction takes place with elastic or plastic contact or with microscopic shearing, depending on the nature of the deformation in the surface layer. Under certain conditions, which depend on the load and the mechanical properties of every friction pair, friction changes into internal friction, or viscosity, which is characterized by the absence of a velocity discontinuity when moving from one body to the other. The load at which friction is disrupted is known as the threshold of contact friction. Rolling friction. The forces of rolling friction are very small compared to those of sliding friction. Rolling friction results from (1) elastic hysteresis losses associated with the compression of the material under load ahead of the rolling body, (2) the work done in redeforming the material during the formation of a bead ahead of the rolling body, and (3) work involved in overcoming the adhesion of the junctions. When the dimensions of a point contact extend sufficiently over the surface of contact, slippage occurs, thus resulting in the sliding friction discussed above. At high rolling velocities, comparable to the velocity of propagation of strains in the body, the rolling resistance increases sharply, and the change to sliding friction is more favorable. Friction is controlled by the selection of the friction pair and the design and proper operation of assemblies; these areas are the subject of a new technical science called tribology. Deriagin, B. V. Chto takoe trenie?, 2nd ed. Moscow, 1963. Kragel’skii, I. V. Trenie i iznos, 2nd ed. Moscow, 1968. Diachkov, A. K. Trenie, iznos ismazkav mashinakh. Moscow, 1958. A force which opposes the relative motion of two bodies whenever such motion exists or whenever there exist other forces which tend to produce such motion. In stationary systems, friction manifests itself as a force equal and opposite to the shear force applied to the interface. Thus, as in the illustration, if a small force S is applied, a friction force P will be generated, equal and opposite to S, so that the surfaces remain at rest. P can take on any magnitude up to a limiting value F, and can therefore prevent sliding whenever S is less than F. If the shear force S exceeds F, slipping occurs. 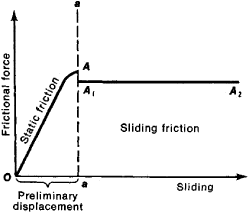 During sliding, the friction force remains approximately equal to F and always acts in a direction opposing the relative motion. The friction force is proportional to the normal force L, and the constant of proportionality is defined as the friction coefficient f. This is expressed by the equation F = fL. In modern engineering practice available materials and lubricants reduce friction to acceptable values. In special circumstances when energy is critical, determined efforts to minimize friction are undertaken. Friction problems of practical importance are those of getting constant friction in brakes and clutches, so that jerky motion is avoided, and avoiding low friction in special circumstances, such as when driving a car on ice or on a very wet road. Also, there is considerable interest in developing new bearing materials and new lubricants that will produce low friction even at high interfacial temperatures and maintain these properties for long periods of times, thus reducing maintenance expenses. Perhaps the most persistent problem is that of avoiding frictional oscillations, a constant cause of noise pollution of the environment. The resistance to relative motion, sliding or rolling, of the surfaces of bodies in contact.